LUPEC NYC and LUPEC SF, the fine first ladies of liquor, know one thing for sure; whisky cocktails are a great way to celebrate achievements of women around the world. And there’s no better way to honor their accomplished sisters in arms who hit the mark with memorable “firsts” all the time than with whisky cocktails made with a brand new spirit – Compass Box Whisky Co.’s Great King Street – Artist’s Blend, a craft Blended Scotch Whisky that has a signature elegance and approachability for both whisky enthusiasts and novices. (www.compassboxwhisky.com). This Thursday in NYC and SF women (and men, too) will unite like their counterparts in countries such as Bulgaria, China, Russia, and Vietnam where International Women’s Day is a national holiday. 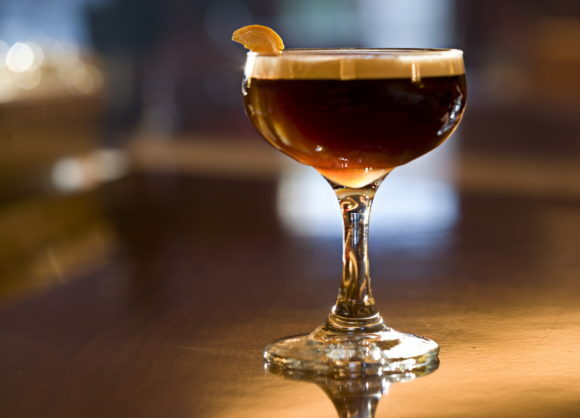 They’ll lift a glass or two for International Women’s Day (IWD), a day to recognize the economic, political and social achievements of women past, present and future. In NYC Compass Box Whisky Co, innovator and award-winning boutique Scotch whisky maker known for breaking down barriers in a once staid category and the NYC Chapter of Ladies United for the Preservation of Endangered Cocktails (LUPEC), announce their 3rd annual “Whisky & Women Unite” cocktail party to benefit Bottomless Closet NYC (www.bottomlessclosetnyc.org). Bottomless Closet is a non-profit organization that helps disadvantaged NYC women become self-sufficient through comprehensive programming and support. Russian hands and roamin’ fingers used to be the sole purview of boys trying to get some action in the back row of the movie theatre, but now it’s time for the girls to put their hands to the test. And for a good cause. Join 16 of New York City’s fastest mixtresses in combating breast cancer as they reach for the well and put their speedy drink making skills and drink knowledge on the line at Speed Rack, the inaugural edition of the national speed bartending competition created by Ivy Mix and Lynnette Marrero of LUPEC and presented by LushLife Productions (www.lushlifeny.com). 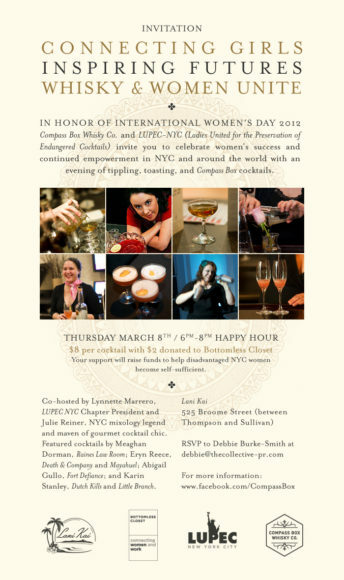 On Monday, March 8th from 6:30- 8:30 p.m., in celebration of International Women’s Day 2010, LUPEC (Ladies United for the Protection of Endangered Cocktails), Compass Box Whisky (www.compassboxwhisky.com) and @sweetblogomine (www.sweetblogomine.com) are co-hosting Astor Center’s (www.astorcenternyc.com) fly-by-night bar featuring tippling and tweeting all night long. 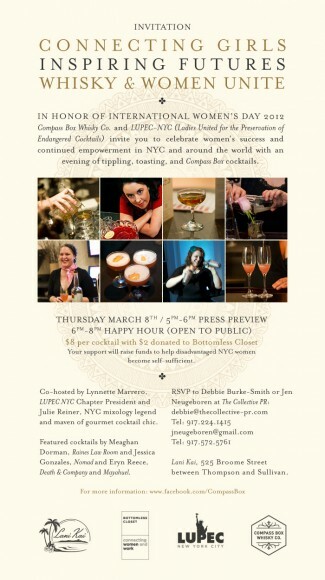 Everyone (yes, men too) is invited to attend this cocktail party fundraiser, with $5 of each ticket going to Dress for Success. Guests will enjoy a tasting of boutique blender Compass Box’s whiskies and cocktails as they toast to women’s accomplishments and empowerment in New York, and around the globe, all while rubbing elbows with some of the fixtures of the NYC cocktail twitterati.